This proposed new three-story urban library building is situated on a sloped site in the heart of the City of Gloucester’s historic center—a site that has been continuously occupied by the library since 1884, when the collection was originally housed in the adjacent historic Saunders House. A new stepped landscape between the Saunders House and the proposed library, organized around an existing beech tree, unites the two buildings on their shared property. 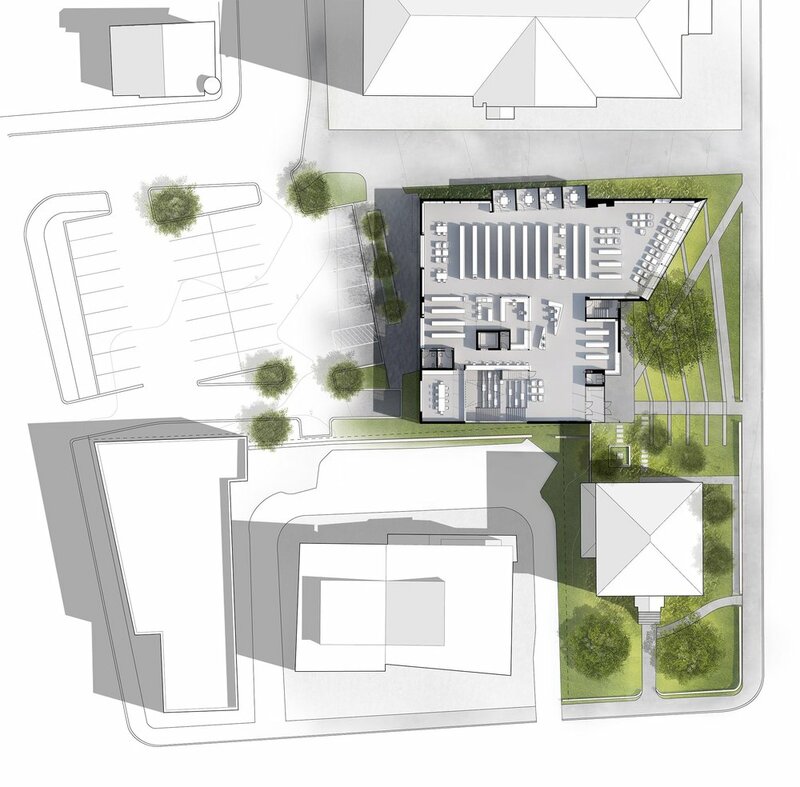 The sloped site necessitates public entrances on two different levels: a lower level entrance directly accessed from parking behind the building; and a middle level entrance on the building’s public front facing Dale Avenue and City Hall. Inside the building, responding to changes in contemporary library programming and use, a stepped multi-media “library common” vertically links the upper and lower lobbies, clarifying patron wayfinding and serving as a hub of both serendipitous and programmed activity. The lower level is designed to allow access from parking to community meeting and activity spaces outside normal library hours. The middle level contains a central staff service point and adult collections and services, with a double height “living room” offering a civically-scaled “window on the City” overlooking the front garden and City Hall. Children and teen collections and services are located on the top-lit upper floor with direct access to a secure outdoor program space. Inspired by regional materials and the city’s maritime location, the exterior palette is comprised of slate shingles, granite, wood, and weathered steel.